The restaurant Torre hosted at the new building, completing Fondazone Prada's OMA-designed campus, has opened. Designed with Chris van Duijn and Federico Pompignoli of the architectural firm, Koolhaas, defines the space as ‘a collage of themes and pre-existing elements combining works of art and design furniture’. Art punctuates the atmosphere of the restaurant with works by italian master Lucio Fontana including Cappa per Caminetto (1949) and Testa di Medusa (1948-54). A polychrome Ceramic Pillar (1947) by the same artist marks the entrance to the restaurant hall where 84 seats are arranged on three offset levels, two of which are furnished with wooden tables and executive chairs by Saarinen. On the third level original furnishings of the Four Seasons New York restaurant designed by Philip Johnson in 1958 live along side installation elements from Carsten Höller‘s The Double Club. Across all three, paintings by William N. Copley, Goshka Macuga, John Wesley and pop artist Jeff Koons adorn the walls. Other artworks created for the foundation by prominent artists include Thomas Demand, Nathalie Djurberg & Hans Berg, Elmgreen & Dragset, Joep van Lieshout and Tobias Rehberger. Outdoors a triangular terrace overlooks the urban landscape of Milan. Metal grids like those characterizing the exterior of the foundation are the backdrop for a restaurant of 20 bistro-style seats accompanied by a bar. 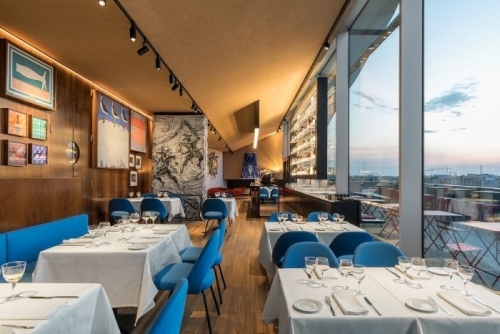 The restaurant is hosted in the newly completed Torre building, marking the completion of the OMA-designed Fondazione Prada site which was inaugurated in 2015. The project completely transformed the site, converting what was once a gin distillery on the southern edge of the city into a bold and diverse complex of challenging exhibition venues. The 60 meter-tall tower opened to the public during Milan Design Week 2018.